2015 Favourites | The Red Brunette. Now that the year is coming to an end, '2015 Favourites' are everywhere! I think they're a great way to review your year and share with everyone what you have been loving. This year (if you know me offline) has been a tough one as I have been sick since January. Needless to say this year hasn't been focused on haircare and makeup but of course I still have some amazing things that I discovered this year. Im going to share with you today my top 10 of 2015. The first makeup product that I loved thus year was this lightweight yet buildable coverage foundation from Rimmel. Sometimes I want something more than a bb cream but doesn't feel like a heavy foundation on the skin and this is just that. I love Rimmel foundations in general because they have a shade light enough for me and their formulas are always fab. If you have never tried this I would recommend running to Boots and picking up a bottle as soon as you can! This year has definitely been an 'eyebrow' year. The phrase 'on fleek' has been invented so I guess it means that we all payed a little more attention to our brows this year. I love this pencil and have it in a couple of shades to match my brows. Some people compare it to the Anastasia Brow Wiz so I guess people think it's good! One side is a powder and the other is a pencil so it is easy to create a softer or more defined look. It's quick and easy and it's hard to go overboard with it so I really have been loving it this year. My friend brought me this back from her holidays during the summer as she knows I only wear brown mascara and I fell completely head over heels in love with it. I know this is a very hyped product so I didn't get my hopes up. But it is one incredible mascara. It does everything, adds volume, length and separation. Even though it stays on my lashes amazingly I wish it was waterproof as that would help my lashes hold a curl but you can't have your bread and eat it! Lush in general has been such a favourite of mine this year. I adore browsing the shop and pick up a yummy smelling shower gel or trying out a new skincare product. I discovered this cleanser back in March and I have been loving it everyday since. Its a basic cleanser that isn't too drying or too moisturising it just gently cleanses my skin which is exactly what I want in a cleanser. It has little bits in it that give a slightly exfoliating feel but it's so gentle that it's suitable for everyday use. This year a lot of French pharmacy products have been swimming across the sea into Ireland which makes me very happy. Bioderma came over and alongside that Serozinc finally reached our shores! I love this product so much my skin just drinks it up. It's really good for bacterial breakouts and just balancing out your skin in general. I always notice my skin getting worse when I stop using it so I never stray too far from this beloved toner! As I have said before Lush has been one of my favourites this year and I absolutely adore their skincare. It's all natural so it is never harsh or damaging on the skin. This mask is perfect to use for spotty skin. I use it twice a week and it calms down all of my breakouts without drying my skin out too much. I'll be posting an updated skincare routine soon so I will be talking about this and my other favourite skincare products more in depth over there. I think I bought this polish in TK Maxx this time last year. As like every other blogger I am obsessed with rose gold and copper things so when I spotted this polish I already knew I would love it. It applies really easily and is quite opaque. It doesn't chip easily which is my favourite thing about this polish. I think a rose gold polish is a must have for any girl who loves painting their nails. 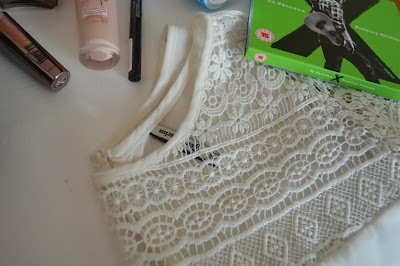 During the summer sales I picked up this top in Stradivarius and it is my most worn, all time favourite top. I love wearing neutrals, that's pretty much all I wear so I like mixing textures and patterns to make my outfits more interesting. The lace on the top and chiffon layers add so much to a simple outfit. It's also very comfortable and comfort comes first for me! Now that it is colder I have been digging out my wooly jumpers so sadly I don't get this out as often as I would like. But it has been a favourite from this year and it has also featured in quite a few on my outfit posts! In June this year myself and my brother invested in a DSLR camera and it is the best thing I ever bought! After spending hours researching and getting advice from people we finally settled on the Nikon D3200. I mainly use it for blogging but myself and Darragh are both really interested in photography. Hopefully in the near future I might invest in a tripod to experiment a bit and play around with the camera. It's so easy to use and understand and I highly recommend it to anyone who wants to invest in a good beginners camera. During July (Everything seemed to happen during the summer!) myself and my friend headed off to Dublin for a couple of days and went to the Ed Sheeran concert in Croke Park which was one of the best experiences in my life. I really enjoy his music and its hard to find amazing music nowadays. His album 'X' has definitely been a favourite this year. As I am writing this post he has just released 'Thinking Out Loud' in Irish which makes me very very happy! The memories from his concert and his music have definitely been some of my favourites this year. What have you been loving in 2015? Ed Sheeran <3 <3 <3 Omg yesss! & Rimmel makes the best drugstore foundations I find! Hope 2016 brings better health for you darling. xo- Merry Christmas and Happy New year!